Like Godzilla in stilettos, London Fashion Week will be taking over the city next week. Five days of stomping fashion-filled goodness lies in store for us. The glitz, the clothes, the celebrity guests…it’s like Christmas in September. If you aren’t lucky enough to get a golden ticket, here are five ways that you can still experience all that London Fashion Week has to offer without one. London Fashion Weekend is a pop-up event for those who aren’t fortunate enough to get hold of those sacred tickets to the big shows. Tickets start from £20 and there are different prices for different packages. You can watch mini shows, shop, get goodie bags and hear talks from fashion industry insiders. This would be a great networking opportunity for anyone wanting to get into the fashion industry. The huge tent usually plonked in the courtyard of Somerset House is being moved. Shocker! The British Fashion Council have decided to put it in the Brewer Street carapace instead. This happens to be overlooked by Bills restaurant, so pop in, grab yourself a window seat and enjoy the crazy hats and wacky shoes walk past. All the best shows are now live screening themselves. So enjoy a FROW seat from the comfort of your own living room. Check out the live streaming schedule here. Treat yourself to a super special fashion afternoon tea. 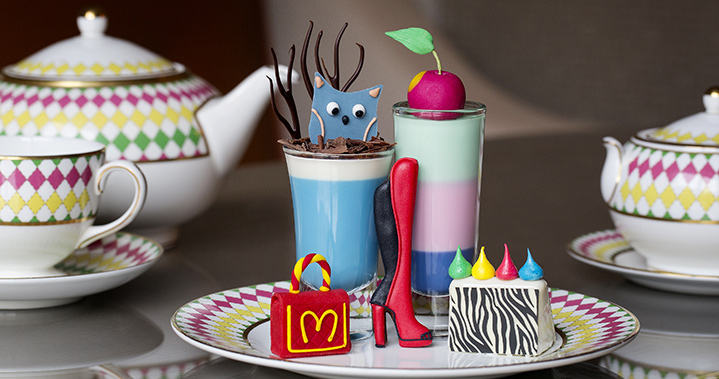 Prêt-à-Portea do one, featuring mini handbag cakes and biscuits that look like designer shoes. You can also head to Balthazar for their Matthew Williamson afternoon tea.